Merry Christmas to all! Well, at least it was when I first had the brilliant idea this would make a good post! Somewhat who is not an animal lover lost some sort of bet. 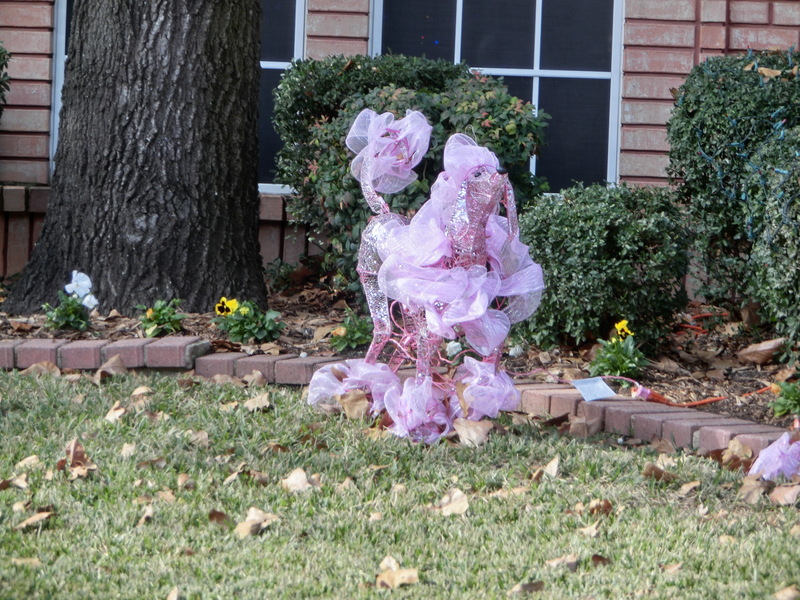 The residences of this house are one of only a few people on the planet seeking a lost herd of pink poodles. This ornament is a constant reminder that there mission is not yet complete! These are the remains of a mummified poodle previously owned by the residences. Or, maybe the ashes are stored somewhere on the present ornament. Thus, allowing “Fi-Fi” do live on for many more Christmases! This ornament is a beacon to the space ships bringing the invaders from the planet “Bark”. The dog works days and the pink flamingo works at night. All of my whining is not really relevant–really it is not. Where my decorations were a few lights and a loud, “Ho, ho, ho!” whenever the front door was opened, this neighbor chose to make their yard a buffet of animals. If they find it important to have a yard for unwanted ornaments (picture the Rudolph special where there is an island for unwanted toys), then it would seem rather petty of me to criticize their special purpose. Were it not for their efforts, their ornaments would have been picked up by a rather large vehicle that makes house calls and picks things up at the curb once or twice a week. 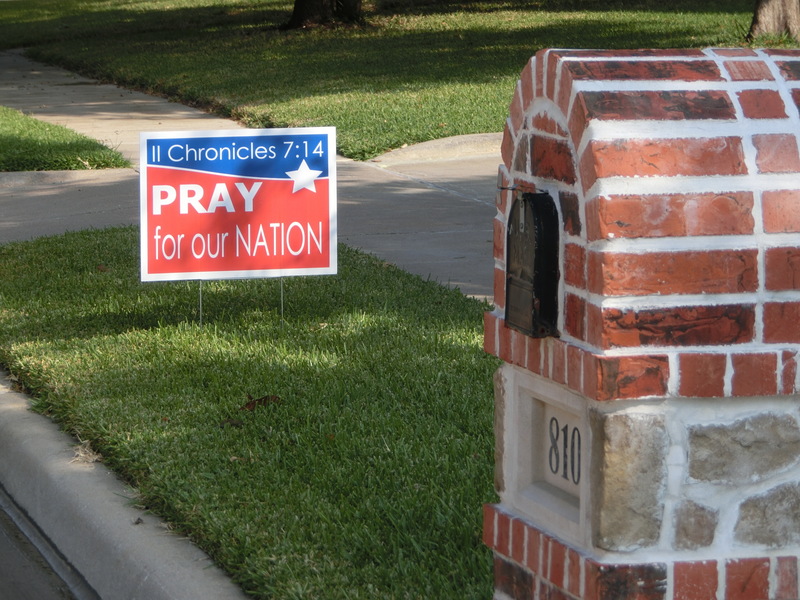 Regardless of where this election or this nation go, the sign points us to Whom we need to put our trust in. The Senate may change hands, or it may not. The evils of the world may infiltrate our borders and make us feel less safe than we have felt in many years. Chaos may reign internationally, nationally or on the local level. But, in your household, commit to a focus on eternal things. You will be rewarded with a peace that will survive any election process. In a world where a teenager in a nearby town uses affluency as a defense in a drunk driving crash (there are numerous other stories that put teenagers in a bad light), it is good to find a story where teenagers in a town just southeast of me did something good. Two girls on the court decided they would make the day of a girl who was pranked if either one of them became the homecoming queen. There will still be youth in my kids generation that will make me doubt whether the country can survive them. (We have, however, survived the past 6 years.) It is acts like what was done by these two young ladies and the school that allow me to keep my fingers crossed! As we have a variety of personal struggles (kids, job, and purpose etc) we think how lucky we are! We have so many things going the right direction. A couple in front of us at church yesterday was also touched by the sermon. There perspective was much different. They listened to the sermon knowing they have an appointment today with a doctor where they will receive the results of tests. It is very likely the test will confirm the husband has Alzheimer’s. Someday that might be my concern, but right now, none of my concerns (I don’t believe) could so rob me of peace.